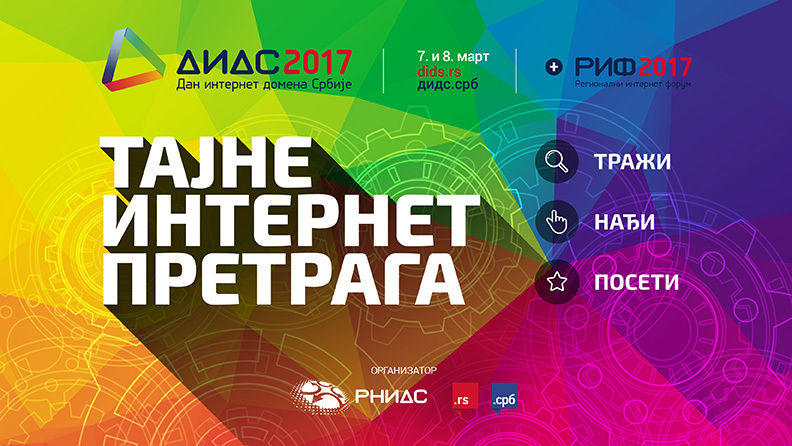 The eighth annual conference on the development of the Internet worldwide and on the .RS and .СРБ domains in Serbia – DIDS 2017, will be held on 7th and 8th March at the Metropol Palace hotel in Belgrade, organised by the Serbian National Internet Domain Registry Foundation (RNIDS). The theme of this year’s Serbian Internet Domain Day, can briefly be described by the slogan: “Internet Search Secrets: Search, Find, Visit”. Google is the main topic of the program during the first day of the conference –visitors will have a chance to learn more about how it works, how to use its tools for creating internet strategy, how to advertise on Google and how to create content that both search engines and visitors will love and finally, how to analyse the results they have achieved. The second day will host the Regional Internet Forum (RIF 2017), which will bring together representatives of the national registries from neighbouring countries along with organisations involved in domain related issues (state institutions, telecommunications regulatory authorities, CERTs and other internet security-related organisations, registrars, local Internet community representatives), and will cover topics of significance to internet domain registries. This year too, DIDS is free of charge to all visitors, with mandatory registration due to the limited number of seats. Registration for visitors will be opened by the end of the February on the dids.rs website.